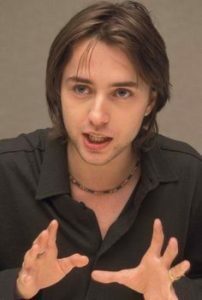 Vincent Kartheiser is an American actor of television and film. He is best known for his starring role as Pete Campbell on the AMC period drama series Mad Men (2007–2015) and as Connor on The WB television series Angel (2002–2004). For his work on Mad Men, he earned six Screen Actors Guild Award nominations for Outstanding Performance by an Ensemble in a Drama Series and won twice along with the cast. His other well-known television credits include Saints & Strangers, Casual, Genius, and The Path. He has also done voice work in The Cleveland Show, Axe Cop, and High School USA!. He has also appeared in the films A Kind of Murder, In Time, Elektra Luxx, Day Out of Days, The Most Hated Woman in America, My Friend Dahmer, and Most Likely to Murder. Born Vincent Paul Kartheiser on May 5, 1979 in Minneapolis, Minnesota, USA, to Janet Marie Gruye and James Ralph Kartheiser, he is the youngest of six children, with four sisters, Andrea, Colette, Elise, and Theresa and a brother, Nathan. He studied at Apple Valley High School in Minnesota. He started acting on the stage at the age of six at the Children’s Theatre Company in the city of Minneapolis and made his screen debut in the 1993 romantic movie Untamed Heart. In 2012, Kartheiser began dating his Mad Men co-star Alexis Bledel. They announced their engagement in March 2013 and married in California, in June 2014. They have a son together. *He was born on May 5, 1979 in Minneapolis, Minnesota, USA. *His ancestry includes German, Polish, Finnish, Swedish, and Luxembourgian. *He dropped out of high school at the age of 14. *He is good friends with Monica Keena. *He got engaged to Alexis Bledelon March 20, 2013.